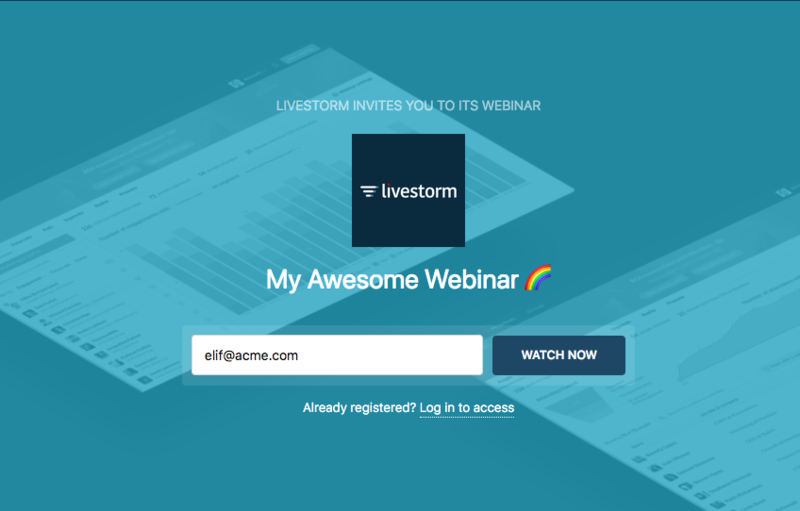 Once your webinar is over, you can make your replay public and available on-demand. This way, you'll keep collecting registrations after your live event. The process will be the same, everyone will be able to register for the replay from your webinar page, and receive their access code to enter the webinar room. 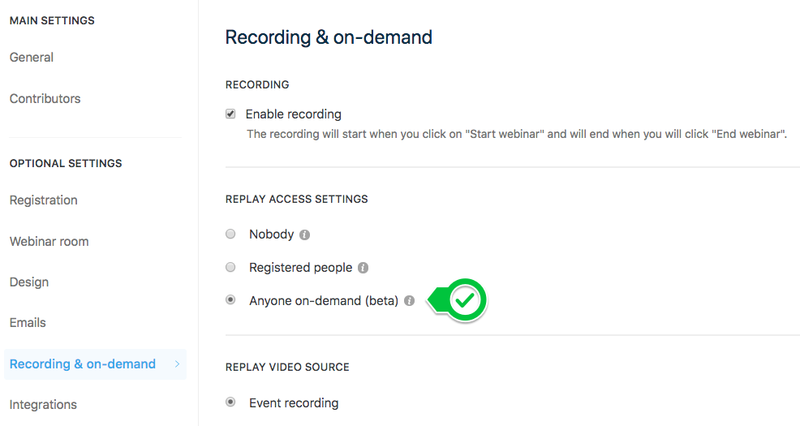 In order to set this up, all you have to do is go to your replay access settings from your webinar dashboard and change access to " Anyone on-demand". 👉Important note: Please bear in mind that a recurring webinar cannot be on-demand. Also, if a webinar already has on-demand registrants, you cannot add additional sessions on it. Once you make your webinar available on-demand, you can go ahead and edit the confirmation email in your webinar settings under "Emails". If you create an on-demand webinar, we recommend you to disable the Chat and Questions tab. This is because you won't get notified if your registrants try to contact you through these tabs. Instead we recommend you to use either or Intercom, Drift, or Help Scout integration to engage with your on-demand registrants. You can achieve this by adding your own Intercom / Drift messenger or Help Scout beacon to the on-demand webinar room. Once you set it up, your on-demand registrants can reach out to you instantly! This will help in cases, where they need to ask you questions about your webinar or just pass any remarks. You'll have a new section on your company page where all your on-demand webinars will be listed. Feel free to check out our article " How Do I Use My Company Page?" for more information on how you can benefit from this feature. 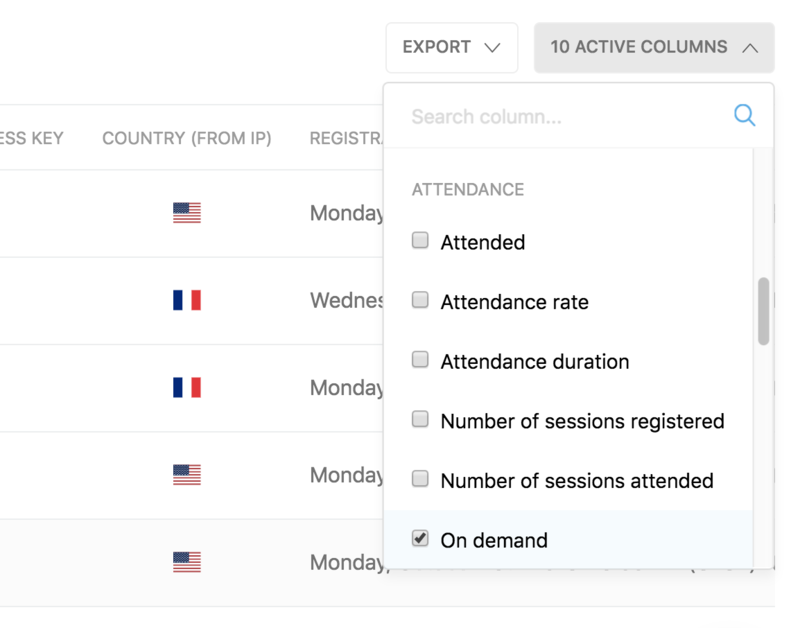 When you connect to your Livestorm dashboard, we will give you an overview of the number of unique on-demand registrants you've had until now. If you'd like to have more details on your registrants, feel free to click on the on-demand webinar on your dashboard. You'll find all the people who've registered on your People dashboard, just without the attendance analytics. You can choose to display your on-demand registrants by selecting "On demand" from your Active columns. You'll find all the people who've registered on your People dashboard, just without the attendance analytics.